Egypt police 'kill 40 militants' in raids after tourist bus attack. Police in Egypt have killed dozens of militants during security raids on their hideouts, the interior ministry has said. The raids killed "40 terrorists" in Giza and North Sinai on Saturday morning, according to a statement from the ministry. It said the militants were planning a series of attacks on tourist sites, churches and military personnel. 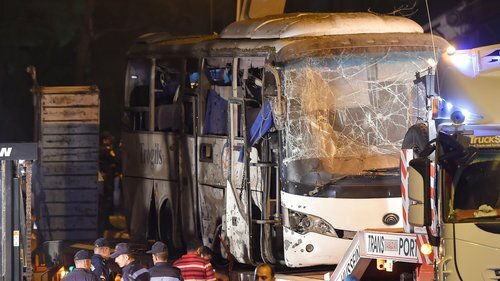 The bomb blast killed three Vietnamese tourists and an Egyptian tour guide.The roadside bomb went off at about 18:15 on Maryoutiya Street in Giza's Haram district as the bus carrying 14 Vietnamese tourists was passing. Four people were killed and eleven others were injured in the incident, . "A group of terrorists were planning to carry out a series of aggressive attacks targeting state institutions, particularly economic ones, as well as tourism... and Christian places of worship," the ministry statement said. It added that police had seized bomb-making materials, ammunition and a large number of weapons during the raids. The country's main Christian minority, the Copts, are preparing to celebrate Orthodox Christmas on 7 January. His Holiness Pope Francis was deeply saddened to learn of the recent bomb attack near Giza. In deploring this senseless and brutal act, he prays for the victims and their families, for the injured and for the emergency personnel who generously came to their aid. Trusting that all will work to overcome violence with solidarity and peace, Pope Francis invokes divine blessings upon Egypt and its people.